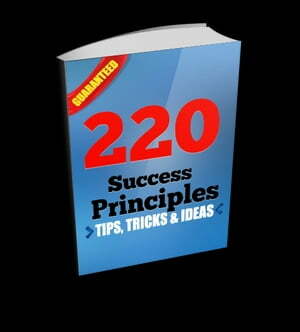 Collins Booksellers - 220 Success Principles by Anonymous, 1230000374668. Buy this book online. When it comes to life and business, it is no coincidence that some people always seem to fail while others always seem to flourish. For sure, chance plays a role in everything. But as individuals, as business-owners, as thinkers, and as parents, we have a significant degree of control over our lives. When we use it poorly or when we don't use it at all, it should come as no surprise that our outcomes are bad. And when we use it thoughtfully and carefully, it should similarly be less surprising when we succeed. Let me give you an example. At work, your employer considers you for a promotion; however, at the same time, she also considers several of your co-workers for a promotion, too. Now, as many do, you might immediately say 'there's nothing I can do to influence my boss in my favor. Instead, this decision will be determined by things that are out of my control.' And, of course, when the day comes, you will not get that promotion. So, without further ado, let's take the plunge. Today, you will stop telling yourself that you have no control over your life; and today, you will learn exactly what it means to take that control, grasp it firmly, and use it to achieve success in all areas of your life.